We’ve told you before that, although they look delicate, orchids are actually easy to grow. There is one tricky part, though: potting. “The hardest part is to get people to understand that you’re not putting them in dirt,” said Joseph A. DiDomenico Jr., president of the Niagara Frontier Orchid Society. You can learn more about how to pot orchids– and even have members of the orchid society repot your orchid plant!– during a new, expanded Orchid Show at the Buffalo and Erie County Botanical Gardens, 2655 South Park Ave., Buffalo. The show is longer, taking place from Saturday, Jan. 24 to Sunday, March 1. Hours are 10 a.m. to 5 p.m.
What makes orchids so different from our garden plants or even other house plants is that they are epiphytic—Orchids grow above the dirt and use other plants or objects for support. In their natural habitat, you’ll find them growing on trees, on rocks and on the surface of the ground, rather than tunneling into the dirt. If you have an orchid that hasn’t bloomed in awhile or might need a larger pot and have no idea how to repot it, you can get help during sessions from 1 to 4 p.m. on weekends starting next week: Jan. 31, Feb, 1, 7, 8, 14, 15, 21 and 22. This is a service the members of the Niagara Frontier Orchid Society offer from 9 a.m. to noon every Wednesday when they are volunteering at the Botanical Gardens, but, of course, not everyone can get there on Wednesday mornings. Offering this on weekends during the extended Orchid Show will be a great convenience for gardeners. If you have a particular pot you want to use, you can bring it, but the Niagara Frontier Orchid Society will have all the necessary materials on hand. That’s helpful since you might need a larger pot and you might not know exactly what size it should be. Donations are appreciated. Please bring no more than one or two plants. During these sessions, you can also talk to the members and get advice on caring for your orchids. There will be new exhibits, too, DiDomenico said. I can’t wait to see the new freestanding displays. They include a window with an orchid set on the window sill. The idea is to emphasize the point that it’s easy to grow orchids in your home. The final weekend of the show offers still more educational demonstrations. You can watch a demonstration on potting orchids and you can buy the special potting mix. Vendors will be on hand selling orchids and other supplies. 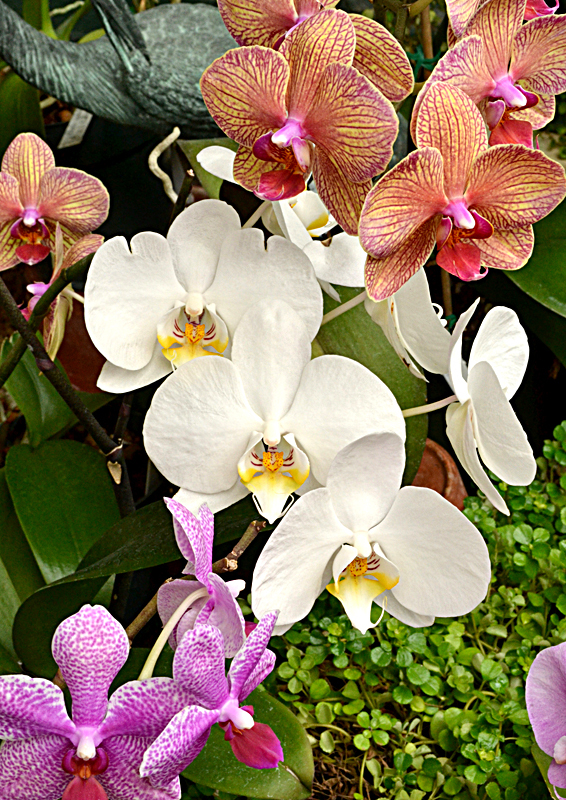 During the final weekend, members of the Niagara Frontier Orchid Society will also display their own orchids, adding to the Botanical Gardens’ specimens and more than 300 orchid plants purchased for the show. The times for the last weekend are 10 a.m. to 5 p.m. Saturday, Feb. 28 and 10 a.m. to 3 p.m. Sunday, March 1. Admission throughout the show is $9 for adults, $8 for seniors (age 55 and up) and students (13 and older with ID), $5 for children ages 3-12, and free for Botanical Gardens members and children 2 and under. Questions on orchids. I have one which keeps tipping out of the plastic pot I purchased it in. Looked like tree bark for soil. I just read dont put in soil. How can I repot this? Is there another location other than the botanical Gardens. Difficult to get to with work schedule. The Niagara Frontier Orchid Society meets at 7 p.m. the first Tuesday of the month (except July and August), and guests are welcome, but that’s also at the Buffalo and Erie County Botanical Gardens. Did you see that there will be potting demonstrations or potting help offered on several weekends during the Orchid Show? That’s in addition to the Wednesday morning opportunities. For more information, go to the Niagara Frontier Orchid Society website. I hope that helps. Nice show each year. I do like growing orchids and yes, the previous commenter should repot her orchid in the special orchid mix which can be purchased at local nurseries that sell orchids. They will also repot it for her if she purchases the container. I would love to bring my orchid into have it repotted but am concerned about how to travel it to the gardens in the cold weather.